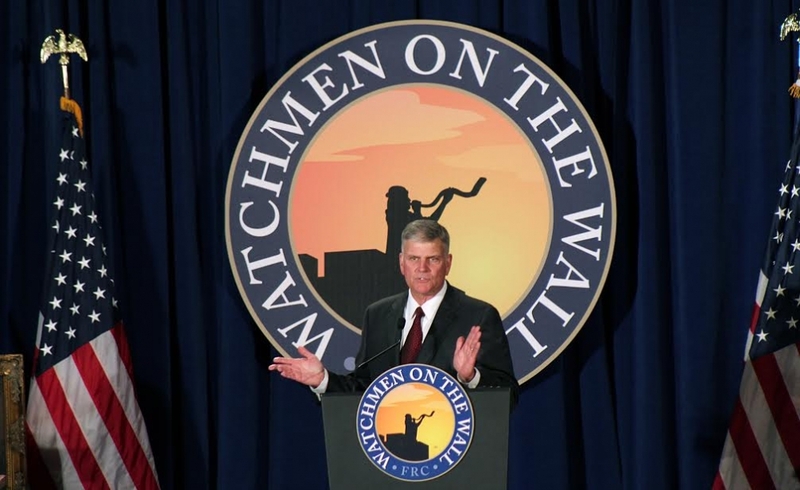 Image of Franklin Graham from The Christian Post. “The definition of a coward: a coward will not confront an issue that needs to be confronted due to fear. That is a coward,” said Graham. Graham essentially used the fear of God to prompt his audience to overcome their fears of speaking out. There are many different aspects of Graham’s talk we could challenge, but I’d like to call into question the role of a wrathful God who hates people in prompting people to change their behavior, such as speaking out on specific moral issues. Graham’s right wing agenda aside, is God really in heaven with his finger on the “hell” button, waiting for us to screw up? I know that I’ve lived this way, fearing that one day’s failure had finally cut me off from God. Most importantly, how does this approach to God’s wrath and holiness compare to the message of Jesus and the New Testament writers about holiness? A misconception of holiness is at the heart of Graham’s statement. According to Graham, God demands a particular lifestyle, one of moral crusading in American culture, and those unwilling to conform to God’s program receive God’s hatred and an eternity of suffering. I’ve stated that crassly, but I believe it’s accurate because I also thought that way for most of my life. It’s pretty much what you’ll hear today if you listen to most Christian radio shows. The only way to avoid God’s wrath in Graham’s system is to change your actions out of fear for self-preservation. Did Jesus relate to people through fear and the threat of his hatred? How Did Jesus Interact with Sinners? Jesus said he didn’t come to judge the world. Isn’t that nice to know? Perhaps he knew that his followers would do enough of that in the future. In fact, Jesus adopted the role of doctor, comparing the “notorious sinners” of his day with the sick. They were still told to leave their lives of sin, but he didn’t walk around telling people to clean up their acts or God would hate them. In fact, Jesus sat down to share meals with tax collectors and women with unsavory reputations. When Jesus saw someone living in sin, whether that was cowardice, sexual immorality, cheating, or violence, he had… wait for it… compassion. Rather than Jesus pounding his fist on the table and shouting that his followers needed to shape up, he slapped his palm to his head when they failed to understand the gift of the Spirit that would empower them to serve others rather than rule as kings. Far from sitting with his finger on the hell button, Jesus rolled up his sleeves and entered into real life with people. He humbled himself, even taking the form of a servant to help us find the way of redemption. He called his disciples “friends” rather than threatening them with an eternity of suffering. Before facing the cross, he promised that the Spirit would come to empower us, fill us wisdom, and guide us into all truth. Yes, there are consequences for rejecting the message of Christ. But he related to others through mercy and grace, imparting his Spirit to imperfect people who desperately needed God’s presence in order to pursue holiness. How Do We Live Holy Lives? Whatever you’re trying to do for the sake of Christ, the most important lesson from the Gospels and epistles is the centrality of the Holy Spirit. You won’t last long by simply trying harder. Living in fear of an angry God will grow old. When fear of God gives way to loving God as a father, holiness becomes a natural response. Graham wants the pastors in his audience to fear God, and he’s hoping that this fear of God will trickle down into their congregations. He wants them to try harder as culture warriors in order to win God’s favor. Sadly, Graham has adopted a kind of works-based righteousness for the sake of a political agenda. Before the cross, God had an intense, undying love for us. I rarely call out specific Christians in my writing, but Franklin Graham’s approach to holiness is contrary to the message of Jesus. It grieves me to think that pastors who look up to him are receiving a message that fails to consider the mercy of God, the healing Jesus brings, and the power we receive from the Spirit to live in holiness. Paul wrote that the Spirit of God does not give us a spirit of fear (2 Timothy 1:7, BibleGateway). We have been adopted as God’s sons and daughters. God demands holiness. It’s not a free for all, but God’s ways under the Spirit are not rooted in fear and wrath. God relates to us as a caring and compassionate parent who desires to restore us—end of story. The bottom line is Jesus came to restore us to relationship with God. I’ve been rethinking that myself about the way I’ve shared the gospel–it’s not JUST come to Jesus and get saved because you’re going to hell, but come to the Father because of Jesus and be changed. (my post today on Social Justice shares that……via Ken Wytsma). Frankly, “I don’t give a damn about Heaven or Hell!” I’m pissed, not just because Franklin Graham is misrepresenting our Father in Heaven, but even more because he is not honoring his father on Earth. There are plenty of “Hell and Damnation” preachers still around and the equal but opposite “God will make you materially wealthy” if you just give yourself to him. When in honest relationship with the Holy Spirit both are clearly the spirit of the devil. Both are at the far ends of the spectrum away from our Father in Heaven. Both are no more the Truth than, “You will not surely die”. None of us have escaped being children and it is normal to be in awe and fear the obvious intimidating power of the (hopefully) father figure in your inexperienced young life. We as children knew in our heart of hearts that we couldn’t survive without our parents but more often than not our mother seemed so much more vulnerable than our father; we needed and feared his persona in our lives. The wrath of my father was very often to my immature and inexperienced mind when he firmly said “no” and I knew he meant it. Some of us were spanked as children and there was wrath felt then but I learned quickly that at least the spanking would end, the “no” from my father was eternal. The worst punishment my father ever did to me was sitting me on the edge of the bed while he sat on a chair and lectured me for four hours, that’s wrath and a seeming eternity. Now that I have grown I realize for certain that my position as the child of my parents was always secure and though I was a handful their passion was always toward my survival to be far beyond theirs. My parents loved me. I became a father when my wife, of three wonderful years together, said, “I want a child.” I, right then, became a father who loved that child and passionately wanted that child to survive far beyond me. I never spanked my children but my wrath was known to each of my children. Twenty years later in a family counseling session they revealed that they fear most that I would kill them. Fifteen years later they each have their own children who know their wrath and from my perspective know better than I their parents’ love. They all know now I love them and always have. I first found real peace and joy in my relationship with our Father in Heaven when I finally dared to openly share my childish imperfections with Him, at age 50. I want to yell so as to be clearly heard deep into Franklin Graham’s mind and heart that both his carnal father and his Heavenly Father love him very much and neither desire him to be the playground bully that he has become. Ed, thanks for speaking out on Jesus’ gospel of grace and Graham’s wrongheaded fear-mongering. Nicely done. Thank you Ed for speaking out. This is courage. To talk about the grace of a merciful God amidst the political “christianity” that tries (in vain mind you) to conform the sinners and Christians alike, to get moral so that Americana can continue. What a crock of you know what. Holiness comes from God and is to be lived out by God through us. Also, when God’s spirit entered us, we became holy. In fact, we ARE the Righteousness of God in Christ. How much holier can we get? Our “walk” fluctuates from day to day, hour to hour, minute to minute doesn’t it? If we depended upon ourselves to be holy, we would all be miserable failures. Holiness has nothing to do with our behavior. It has everything to do with who we are in Christ. And as you referred, once you begin to see God as Father and the love His Son has for us, our lives, more often than not, will reflect this outward manifestation of holiness that we already posses inside. If we listen to the law preachers, than we would need a list to check off daily. 1. Did I not swear today? Check. 2. Did I not get angry today? Check. 3. Did I not lust after a woman today? uhh, maybe. Check? 4. Did I walk with just the right gait balance between bounce and drag? Check. 5. Did I witness to at least one person today? Shoot. I missed that one. My holiness meter just dropped a bit. 6. Did I smile at everyone today? Almost everyone. There was that one guy that was looking at me funny so I didn’t smile at him. Holiness meter dropped another notch. Can we see the absurdity of this kind of thinking? Can we see that it mocks Christ? It mocks a God who died on a cross to forgive us of all unholiness. So that now, whether or not I get mad has nothing whatsoever to do with my relationship with Christ. Then we could say, well, Love is everything. Ok. Did I love everyone today? Nope. Did God through me? Yep. Is God in me? Yep. Am I in Christ? Yep. Am I seated in the heavenlies with Christ right now? YES! Than am I holy right now? You bet your sweet potato I am. Do I get any credit for that? You bet your sweet Idaho I do not! The great America, which I am thankful for, is falling. The entire west is falling away from grace, while the east or “South” as some scholars have sectioned it, is rising. Try to find a church that does not concentrate on behavior and programs and projects. Try to find a church in America that concentrates on Jesus, on who we are in Christ and on trusting the Holy Spirit to lead us. I’ve sat down with many church leaders. Some have told me to leave their church. Some have called me a lazy Christian. But one said the message I brought him from God was like water flowing over his soul. It revitalized him and made him jump for joy. God has already prepared works for you to do in advance. And you will accomplish them in His time and by His power. Let us run from the preachers of the law and seek out those who know and love the gospel of mercy and grace. And I do mean RUN!!! Preach, Mike! This is the gospel I know and love, because it’s the true gospel of Christ. Lord Bless you Tim. It’s good to know such brothers like you are out there. You are chosen by God because you believe the gospel of Christ. Praise His Name. I am fed up with these hypocrites who preach the law and yet, are themselves law breakers as must be the case. It’s so very, very dangerous to preach the law as a Christian. So very wrong. You know brother, when Paul spoke to the Corinthians or Ephesians or whomever, and when he brought up such things as their behavior, it was not his intention to bring them back under the law, but to instruct them on how they should be living for Christ. Our mistaken preachers in America can’t seem to grasp this concept. Why? 1. Power. Some men/women want power. They want to control their congregation. The law accomplishes this quite efficiently. For a time anyway. Then the pews start to become more prevalent. 2. Ignorance. They just don’t know how to decipher and interpret the epistles and the gospels. 3. A true desire to glorify God. Through their efforts, they are hoping to please God. When in reality, because of their faith in Christ, God is already pleased with them. 4. A demonic influence. Paul was not kind to those who would mix law and grace. He was very abrupt in his judgment. “May they be condemned.” Harsh. 5. God’s word is true and some don’t want to believe it. Where there is wheat in the church, there will be weeds. And we are not to pull out the weeds for we would root out the wheat as well. The remnant of God is exactly that, just a remnant. Let us be so eternally grateful to be in that number that our lives reflect what being a remnant truly means. And that is, to simply live by faith. Where I go, God is. Where i stand, God is. Where I rest, God is. And only God’s works are worthy. My works are nothing but filthy rags. By the way Tim, I guess I’m both Mike Maz, and chozen1956. I can’t figure out this log in stuff. “Where there is wheat in the church, there will be weeds” – great insight Mike/1956! Tim, Mike and 1956 [ :-)], I need to chime in here because not only do I love you guys but I still can’t help but love Franklin Graham. When I was 17 I felt the call because I actually saw the hand of God balancing the life I knew around me. I committed to spirituality as reality to reach for and realized how limited physicality was and that was what I thought I knew best. I did the theology classes in seminary thing and sat down to counsel a couple my age only to realize beyond someone else’s theory and interpretation I didn’t know what in the hell I was talking about. God has personally taken me by the hand for 53 more years and led me through many exercises (some painful and some joyful) to teach me about Their love and my childhood. I have made many childish errors all along the way and still do. I don’t think what I’m about to share is in error and I just have to share it for Franklin’s sake. I cannot judge but I can share my experiences the best I can understand them. I see moments in my life nearly trapped where I see Franklin (and many other spiritual preachers of all our Earth’s religions) in knowing God must exist so therefore I must be called to direct others as to just what they must do to be received by God. There is Taliban in all religions of this world. Mike I think you hit on the key word; “ignorance”. All of those preachers display, from my perspective, an awareness of God in their minds and a sense of God’s power in their hearts but no relationship with God as one of the family. All of those preachers sacrifice the freedom of play at the beach as a beloved child in the Family of God by trying to be the adults in the family they are grossly ill prepared for. They are usurping our Father’s capable and responsible authority over the entire kingdom when they can’t see beyond the playpen they’ve been placed to be safe. Those of us in the same playpen are very often intimidated and manipulated to follow their blind lead with the threat that Daddy will spank (or kill) us if we don’t. What I today am not ignorant of in my heart and mind is that Daddy can speak for Himself without my siblings badgering me. Franklin Graham does not know that as is clearly displayed by his bullying tactics. This is off the cuff and I’m sure is riddled with errors but I have to share this and this is why I’m so verbose through so many mediums available to me: God is real and available to all personally and equally. The Father and the Mother of God’s Family understand children like us much better than we have the resources or skills to understand, seemingly infinitely better. Yes, They do want us to begin to learn to serve and lift up our siblings while we play to strengthen our resources and skills. All of us are welcome to join the Family as children (acknowledging we are children incapable of being adult mentors to our siblings like Jesus does) full of love for all who will show us mercy, tolerance and grace; including first all the love we have to offer for the authority of our Lord God. Jesus teaches me one more lesson that is not a stipulation for entry into the Family. Jesus teaches me the value of loving my enemy who does not show me mercy, tolerance and grace. That is Franklin today and I pray that if Franklin one day accepts becoming an infant of God that I am there to hug and welcome him into a divinely fun Family. I do know recognizing the problem is not offering a solution. What I can offer because I’ve witnessed it working in my and other lives is getting off alone (a quiet wilderness) and having a heart to heart ta with God. This means baring one’s heart, soul, strength and mind to share all the adorable but challenging childish imperfections we each uniquely are to be fully honest and loving with one’s self and our Father in Heaven we perceive but can’t fully comprehend. It is a scary endeavor but safe, trust Him. I don’t do well at exposing my heart and mind to my siblings of mankind but our Father can do so perfectly and has in my life. I am blessed and I thank Them every moment as we walk, talk and play together through this life. I want the same for Franklin. Thank you for your love. In Christ, I love you as well. I’m going to be kind of all over the map here. Hopefully, it makes some sense. Though I don’t know what you are talking about half the time, especially the constant referrals to us being like little children and God being mother and Father and what not, but I do understand having a love of the brethren even though they may be in great error. And I do understand your concern for Franklin Graham. It is very concerning. The whole church is becoming very, very concerning. Yet, I am not disheartened. I understand that only a remnant is real. Only a percentage of those who claim to know Christ, actually do. This could put some in a state of worry, sadness, misery. But I remember that God is good. God is perfect. God is holy. God is just and righteous. His ways are right. His ways are the only ways that matter. So then I feel more than grateful to be one of the chosen. There are no words for how very thankful I am. I also have been bestowed with a disdain for the Christian who preaches the law and dares to place Christ back up on that cross. Not just disdain. But indignation. Now, for those who are simply ignorant and think they have to please God by doing, my heart is tender towards them. To those who would try to browbeat us, strip us of our inheritance and diminish the blood of Christ, I have very little patience. Jesus and Paul have shown us repeatedly that we are not to tolerate the teachings of the wicked. In my world, that means we are to have the courage to stand against the law bringers in the church (in whatever form that might take minus violence of course). If I were at that conference of Grahms, I might have publicly called him out. Probably not. Perhaps I would have simply walked out. Love is not a feeling. Love is an action. Love is Christ nailed to a cross. Love is disciplining a disobedient child. Love is many things Herm. The western church is in a state of apostasy. And frankly, it always has been. In fact, many of the early churches were in just such a state. Paul was both harsh and kind to those churches. He gave them warnings. He reminded them of who they were in Christ. And he condemned any who would preach the law or another gospel. He condemned even Peter. He had a massive falling out with him over the law. Yet, Peter was given the keys to the Kingdom right? And we do know that Paul looked up to Peter as some of his writings imply. “Instead we should write to them, telling them to abstain from food polluted by idols, from sexual immorality, from the meat of strangled animals and from blood. For the law of Moses has been preached in every city from the earliest times and is read in the synagogues on every Sabbath. Then the apostles and elders, with the whole church, decided to choose some of their own men and send them to Antioch with Paul and Barnabas. They chose Judas (called Barsabbas) and Silas, men who were leaders among the believers. With them they sent the following letter: The apostles and elders, your brothers, To the Gentile believers in Antioch, Syria and Cilicia: Greetings. ‘We have heard that some went out from us without our authorization and disturbed you, troubling your minds by what they said. So we all agreed to choose some men and send them to you with our dear friends Barnabas and Paul–men who have risked their lives for the name of our Lord Jesus Christ. Did you catch that? James was speaking to Jews about the new Gentile believers from the perspective of the law. So, God working with men through all his faults, in other words, imperfectly, allowed the apostles to give a few commands to new gentile believers. The Holy Spirit at that time, felt perhaps that the freedom in Christ might encourage the gentile “dogs” to misrepresent the Body of Christ. Therefore, some law was given. But, let’s remember, these few basic instructions of how to satisfy a moral life, is in no way the gospel. It is teaching a people who were wild, who didn’t have the law, who slept with their own mothers and laid with women at their temples…who committed every atrocity known to man, some boundaries. We should always understand that on this side of the cross, nothing can make us holy but Christ Crucified. Nothing can make us any cleaner, better, more pleasing to God. Nothing but again, the belief in Christ Crucified. Therefore, behavior is just that. It is a byproduct of our spiritual life. When we are encouraged to live holy lives, we should remember that we already do and by remembering that, live accordingly, freely, without any condemnation. Finally, I don’t know everything. I barely know how to sign onto this blog site. But one thing I do know Herm, is Christ crucified. My sins are forgiven. My soul is sealed by the Holy Spirit. I am written in the Lamb’s book of life. I am convinced that neither death nor life, neither angels nor demons, neither the present nor the future, nor any powers, neither height nor depth, nor anything else in all creation, will be able to separate me from the love of God that is in Christ Jesus my Lord. And I’ll be darned if I’ll allow anyone to try and persuade me otherwise. Thanks Mike! It occurs to me in reading your passionate response that all that matters to me is that we both realize that the Father, Son and Holy Spirit are infinitely smarter than all of us put together. There is no need to understand me or Franklin Graham to inherit eternal life. There is only a requirement to bond together with the Lord God with all the love we each uniquely are (heart, soul, strength and mind) and our neighbor to the same degree we love our self. The love as taught by Jesus is constructively and productively serving our Lord God, our neighbor who shows us mercy and our selves. That love is for certain when it is “all” we have to reciprocate an unbreakable bond which is tolerant, merciful and graceful, productive and constructive; perfect as is our Father in Heaven to us. It really doesn’t matter whether I am too smart or not smart enough for anyone. What matters to me is that I can serve to shed some appealing glimmer to light the way to the One God I know who knows every heart and mind personally enough to be perfectly smart enough to answer their every need. From the example of my Teacher today a constructive mentor has to meet those who wish to learn where they are at and that it is destructive to demand a student must immediately rise to the perfection level of the Teacher. That is the only reason I desire eternal life for it will take a minimum of that amount of time to rise in effectiveness to the level of my Instructor. I don’t want eternal life if there is no joy and peace in learning for that long a period of time. I will not accept any father, carnal or spiritual, who I have to always be watching my back for fear he’ll strike me for the ignorance I so want to shed, especially my ignorance that might be as destructive as is Franklin Graham’s. Peace and joy to you Mike! For the most part I agree with your evaluation of F Graham’s idea of courage, righteousness, or holiness. It’s more political and cultural concerns, not the gospel per se. I’m not a big fan of his, but he’s certainly got a bigger platform than I would ever think to have, as well as a heritage (his mom & dad) that I don’t have. We, believers, DO need to speak what is true, and speak out at times, but in love. We also need to be careful to not succumb to one cultural view of things or another. I see this as a danger in reaction, or over-reaction, to hard-line attitudes such as F Graham’s. I don’t subscribe to a guilt and anxiety generating fear of God, but I also believe we (pastors, teachers, churches, believers, etc.) have neglected the whole topic of the fear of God, or tried to avoid it. Kind of hard to do when it’s spoken of in both the OT and NT. Perhaps it’s an area you’ve addressed before and I haven’t read. It’s a topic I want to blog on in the near future. Thanks for sharing your heart and the truth. Trip, you fear the awesome potential of our Father in Heaven and that is good. I no longer fear Him, though the limits of His yet to be exposed infinite potential remains to be feared in overwhelming awe, for I know Him and He loves me as His child with the infinite grace to be tolerant and merciful in correcting my unintended ignorance and childish behavior. Through Jesus’ teachings as is carried today to each of us through the Bible fear of how far we (pastors, teachers, churches, believers, etc.) have strayed from the Father’s consistent and final will for us is the beginning of getting back in harmony through the Holy Spirit. The Holy Spirit maintains that harmony by leading our hearts and minds reciprocally bonded to God with love. There is no fear in harmony. There is peace and joy in harmony with our creator God. I wish I could spend a week with you in Bible study together in counsel with the Holy Spirit because you are truly sincere. You speak of your fear of succumbing to cultural views. There are many Christians today who know that fighting crusades, burning witches, subjugating women (… Yellows, Reds, Blacks and gays), anti-birth control, anti-abortion, Sunday Sabbath and many more practices in the name of God are all cultural views not supported by the Bible and have strayed from the Father and the law written in each of our hearts and minds. On those cultural views I will no longer succumb. They are my father’s views and not my Father’s views. Woe to you, teachers of the law and Pharisees, you hypocrites! You shut the kingdom of heaven in men’s faces. You yourselves do not enter, nor will you let those enter who are trying to. I don’t subscribe to a guilt and anxiety generating fear of God either. I know that with the Holy Spirit actively sharing in my heart and in my mind there is actually joy and peace with no room for fear from the Source; only undying trust. Different from the carnally peer group led boy I once was I don’t see myself as any less or more important than any other in the body of mankind. God loves us all equally and that love cannot be earned but can be accepted. I am uncomfortable when I’m misinterpreted as a faux judge, jury and executioner for I do not judge but do share what disagrees with my relationship with God. I can’t execute penalties nor am I able to know the hearts and minds of those I share with as can my Lord God in Heaven. Today I do to you what I would have you do to me. I love you so much that it is easy to be tolerant and merciful but, sorry; I am only just beginning to understand the depth of Jesus’ expertise in grace that He showers on me. I can fear that I might succumb to my father’s logical truth that is culturally different from my Father’s eternal Truth; Luke 14:26. I remain fearfully vigilant and am constantly testing the fruits of my labors in counsel with the Holy Spirit. The fruits of the Holy Spirit planted in our hearts and minds are obvious because there is no taste of intimidation, manipulation, confusion or subjugation shared with any other. Fear is intimidating to stimulate us all to be wary of the unknown. Fear can and has been used throughout all of history by mankind to subjugate through intimidation and manipulation the ignorant to the profit of the human teacher and not to the profit of our creator God’s kingdom. Only by the authority of our Father in Heaven can fear be wielded lovingly to the profit of all of His kingdom and Family. Love attracts because it dispels hate and instills peace and joy by the bond of reciprocated valuing. The “Good News” (the Gospel truth) is that our Father in Heaven wants to share love with us eternally. We can light the Way for those who fear their unknown creator God to find peace and joy in their hearts and minds by sharing the light Jesus served to our hearts and minds. My neighbors are those of mankind who show me mercy (as did the good Samaritan to the Jew) and I really do love them as I do myself. My neighbor could easily be Roman Catholic, Black, Muslim, gay, Jewish, female or Hindi (to name only a few of the many, many neighbors who are different than I and influential in my life). Perhaps, you could include this in your proposed blog on fear. Thank you and peace my neighbor Trip. I’d like to address two comments you made if I may. I try to live by a creed that has served me well when adhered to: Speak and do as the Holy Spirit leads me. I strive to “just be” and let God do the work and say the words. This is nothing I have to think about. I am not striving toward a specific goal as I am not called to do so. I have been called to simply, “Be” or rest in the Lord. And I have a feeling that resting in the Lord is an action or state of being that far too many of us brothers do not even attempt yet in my opinion, is crucial to living an abundant and Christian life. We somehow think it is our responsibility to change the world. I say, nothing can be further from the truth. It is not my job to save anyone or to preach morality to the sinner. It is my job to let God do His job through me. And the works that God has planned for me before the creation of the world, will be accomplished. Now, I do say we should speak out to the church. And what I would suggest is that we speak out against the trappings of the law. We should be teaching of the grace of God and our right standing with God. By concentrating on who we are in Christ, we can be assured that we will bear good fruit. If you were gay, by me telling you that homosexuality is an abomination, for example — that may or may not have any effect on your behavior afterwords. What it would probably do is cause more sin. However, by me telling you about your relationship with God and that from God’s point of view, you are no longer a homosexual, but a saint, this may renew your mind and spur you towards a life that is able to deny the flesh. 2. Fearing God. There is absolutely a healthy approach to fearing God. But it is not as some would have us understand. To fear God as a saint is to reverently respect God. Love God. Thank Him for what He has done for us and to praise God. Fearing God in an incorrect manor will produce bad fruit. it will produce fear in your heart, which will distort the view of God that He would have His saints not take part in.